Use this product once you have opened your bottle of wine, to preserve the freshness of the remaining contents. Instead of trying to squeeze the cork back into the bottle, use this convenient, reusable stopper. This handy tool will prolong the life of your bottle of wine for sometime after it has been opened. The wine bottle stopper is made from food grade silicone, and fits standard wine bottles. It may also be used on other bottles with similar openings. The colors of these stoppers are festive and at the same time elegant- black and maroon/ burgundy will compliment any table setting. Colors exactly as pictured. This is a small price to pay for peace of mind and satisfaction with your purchase. Imagine the faces of your guests at your next dinner party, when they realize that you care about your wine and appreciate your vintage. These stoppers also make excellent party favors. AIR- TIGHT : This wine bottle stopper creates an air-tight seal which will prevent your wine from spoiling and prolong the life thereof after opening. Just place the tapered side into the bottle opening and push down- to remove, twist and give a small tug. The snug fit of this product will please any wine connoisseur. Stop worrying about when you opened your bottle and rely on this tool to preserve the vintage. REUSABLE : Impress your friends over and over when you produce this tool and look like a connoisseur. This wine bottle stopper can be hand-washed or placed in the dishwasher- ready when you want to use it again. MATERIALS AND COLORS : Superior quality Food Grade Silicone and stainless steel core. The sophisticated black and maroon colors match most wine bottles. Your dinner guests will compliment your elegant choice of stopper and be impressed with it's performance. You will receive the exact pictured colors and your guests will ask you where you found such an effective, inexpensive and handy tool. GREAT GIFT FOR A HOST and an EXCELLENT PARTY FAVOR : This is a thoughtful gift for an entertainer and a useful gift for any host. Give these wine bottle stoppers away at your next soirée or event. TAKE THE STRESS OUT OF OPENING A BOTTLE FOR JUST ONE GLASS : Forget about the stress caused when you only finish half a bottle of your favorite wine and use this tool to keep it fresh for tomorrow night. Don't hesitate to open a bottle of wine because you fear that you will not finish the bottle tonight- this tool will keep it fresh so you can enjoy it later in the week.Purchase this wine bottle stopper now, because you don't want the neighbors to have it before you. 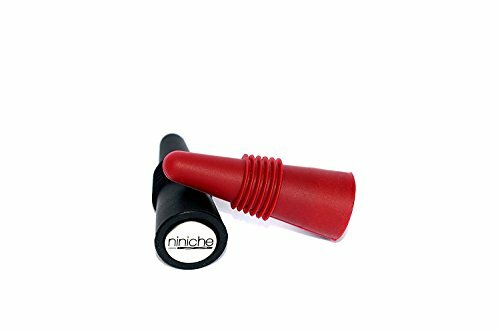 If you have any questions about this product by Niniche, contact us by completing and submitting the form below. If you are looking for a specif part number, please include it with your message.